Favorite film franchise with five or more entries? On the day of his fifth wedding anniversary, Dagwood is in trouble needing to raise $563 to pay back on an endorsement check that went sour to a woman named Elsie. Dithers (Dagwood's boss) says he will give Dagwood $600 as a bonus (plus a $10 raise that Blondie has been wanting Dagwood to get) if he can secure the contract from developer C.P. Hazlip. Hazlip, not wanting to see any salesmen such as Dagwood, becomes friends with Dagwood while indulging in one of their hobbies, tinkering (in this case a vacuum). Blondie becomes jealous when a man from the finance company comes to the house about "Elsie's note". 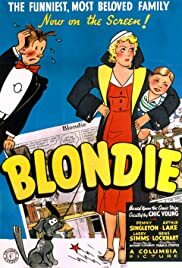 Blondie suspects her husband is having an affair and confirms her suspicions when she finds Dagwood at Hazlip's hotel with his daughter Elsie. Dithers believes Dagwood is not getting any headway with the Hazlip deal so he fires him (not the first or last time this will happen) and Dagwood is further in Daisy's doghouse when Blondie, her mother and sister believe he is unfaithful. What is our lovable protagonist to do? I haven't seen any other films in the Blondie series, but it is easy to tell this is a standout film. Singleton and Lake are the perfect people to play the lead roles and Simms is adorable as Baby Dumpling. The script has numerous funny scenes, many of which are humorous touches to the film that don't develop the scenario further, but that is no big deal here. At the beginning of the film, the scenes alternating with Dagwood and Blondie didn't seem that smooth, but that may be the only flaw of the film. Rating, 9.